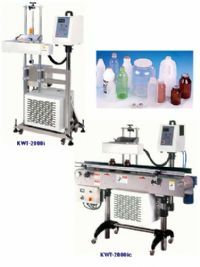 The power supply and sealing coil is mounted to a portable cart for easy mobility from line to line. The power supply and sealing coil is mounted to an additional 1.5 meter long conveyor with swivel castors making it a complete stand alone system. Durable conveyor main construction is built by stainless steel with adjustable conveyor rails for diffrent bottle sizes.